Approximate Weight is between 200 to 230 Grams and is one side beautifully polished.And all other side is having a Natural Rough look.The pictures given are illustrative, but you will be getting the similar rock. Good to keep at home and offices to remove negative energy. It has to be washed with normal water to be cleaned, if possible keep in Sunlight which is not compulsory. Keeping the rock in sunlight with energize the rock. 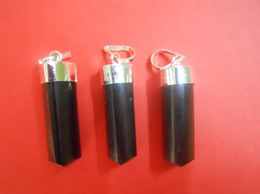 Place the rock in the corner of your room or workplace so that the negative vibes and the dirty energy is absorbed by the Black Tourmaline rock. It is advisable to wash the rock in 3 to 4 days for for better results.Excellent results are seen. The pictures of the Half polished black tourmaline rough are illustrative, but you will be getting similar pieces Buy in BULK and ask for the discounted price, where you will also be saving on your shipping bill.